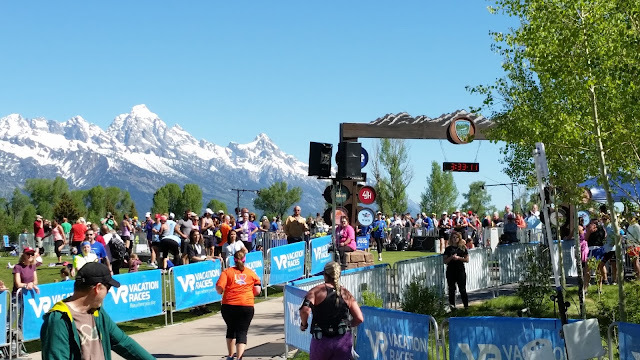 This morning about 2,000 runners traversed the 13+ mile course to finish the Teton Half Marathon on our practice tee at the Jackson Hole Golf & Tennis Club. Their determination was rewarded with the gorgeous view, medals, chocolate milk, and snacks... Congratulations to all the participants! Thanks goes out to the folks with Vacation Races for putting on such a popular event! Special thanks to all the players that still got your morning rounds in despite the circus-like atmosphere around the practice area! And to anyone like myself concerned about what all of that traffic may do to the practice tee and surrounds: we have scheduled light aeration, topdressing, and fertilization treatments and should see no ill effects going forward.